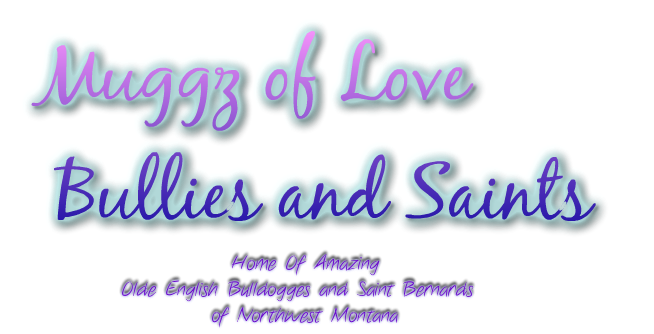 WELCOME to Muggz Of Love Bullies and Saints located in the beautiful mountains just outside Kalispell, Montana in the beautiful Flathead Valley and at the edge of Glacier National Park. We have raised Saint Bernards for 10 years and have always wanted to raise English Bulldogs. But when we met Titan our hearts were stolen and we knew right then and there we wanted to raise Olde English Bulldogges. I did all the research I could to help me conclude that they were definitely the dog for my family and I. After being raised with big breeds my whole life from Rottweilers and Dobermans and then raising Saints with my own family I knew this breed was our match. We are passionate about our dogs and treat them as our family. Our dogs go with us to the lakes, hiking, walks, and on our many camping and family trips we take. We give them ample exercise and proper nutrition. They are introduce to many types of animals on our small farm and many different people to make sure they get the proper socialization they need to become all around great dogs. We also strive to keep our dogs in a well balanced mind set. We are now focusing our life to help preserve the Olde English Bulldogges that they once were by proper selective breeding. We strive to raise healthy happy even tempered family dogs. We are just beginning our journey in raise these wonderful loves and would love for you to join us. So please keep checking us for updates and new pictures. 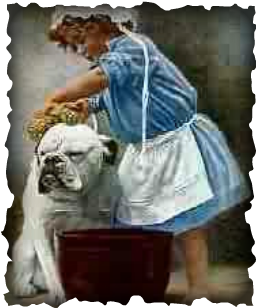 We are also always willing to talk to anyone that wants to know more about Olde English Bulldogges or Saint Bernards. My husband and I have been married 17 years and have 8 wonderful children that we home school. We base everything we do from work to play around our family, including our many dogs. We are an I.O.E.B.A. registered kennel and stand by their standards of Olde English Bulldogges. If puppies offered for sale to persons inquiring are to be registered, they will be registered only with the International Olde English Bulldogge Association (IOEBA) or other registry with equivalent standards and requirements. If such puppies are not to be registered, I will inform the buyer of that fact in writing. I will refrain from releasing any puppy until it is at least eight (8) weeks old. the time frame during which the puppy or dog may be examined by a licensed veterinarian, at the buyer's expense, and, upon written recommendation of the veterinarian for specific reasons, the puppy or dog may be returned to the seller for a full refund of all money paid.